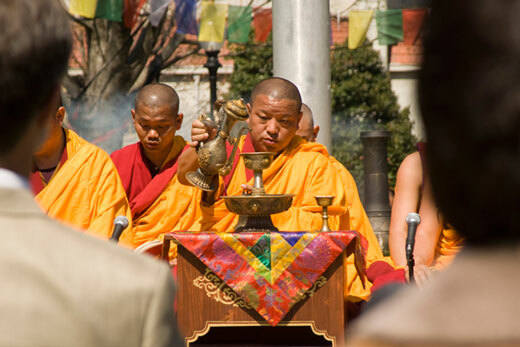 Emory University's Tibet Week 2015 celebrates the theme of "Exploring Compassion" through a series of traditional events and educational opportunities. The annual celebration of the culture, arts and philosophy of Tibet is set for March 23-28. Tibet Week begins at noon Monday, March 23, with the incense offering and opening ceremony on the university Quadrangle and in the Carlos Museum Reception Hall, led by Emory faculty member Geshe Lobsang Tenzin Negi and the monks of Atlanta's Drepung Loseling Monastery. The week's line-up of events features daily guided meditation and live exhibitions of mandala sand painting, as well as discussions on the legacy and the healing powers of compassion. The week-long exhibition of live mandala sand painting begins March 23, from 1 to 5 p.m., and continues daily from 10 a.m. to 5 p.m. through March 28. The monks will construct a mandala of the Buddha of Compassion. The closing ceremony, also with the Drepung Loseling monks, follows a talk at 1 p.m. on Saturday, March 28. Most events, including daily meditation, sand mandala painting, and the opening and closing ceremonies, are held in the Reception Hall of the Michael C. Carlos Museum, 571 Kilgo Circle NE, adjacent to the campus Quadrangle. Parking is available in the Oxford Road Deck and Fishburne Deck.